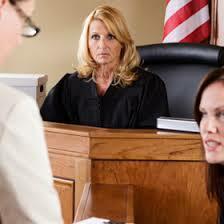 Injunction cases are called in no particular order regardless when your attorney signs you in at reception. The presiding judge will begin the hearing by introducing himself/herself and outline the possible outcomes. Because the petitioner is the person requesting the hearing, it is the petitioner’s burden to proceed first. The petitioner will generally testify as to the specific actions by the respondent that places the petitioner in fear. These actions can include prior acts of violence, threats of present violence and other relevant factors. If the petitioner has witnesses, each will be called to testify and answer questions by the petitioner or her/his attorney. After each witness testifies, the respondent or his attorney will have the opportunity to cross examine the witness in an effort to dispel any fears of future violence. When the petitioner has concluded her presentation of evidence, it is the respondent’s turn to testify and call witnesses. The respondent’s presentation is focused on dispelling any fears of future violence as well as defending against the allegations of present domestic violence. Keep in mind, these hearings are civil and not criminal. There is no jail sentence that can be imposed if the judge grants the petitioner’s request of imposing a domestic violence injunction. If the judge rules in favor of the petitioner and imposes sanctions, it will be a criminal offense if the respondent violates the judge’s order. Hiring a Winter Park domestic violence injunction attorney can greatly increase the chances of a favorable outcome in your case. TILDEN LAW is rated A+ by the Better Business Bureau and has 20 plus years experience representing clients in Winter Park Domestic Violence Injunctions, Winter Park Dating Violence Injunctions and Injunctions for protection against repeat violence. Contact TILDEN LAW for a free and confidential case evaluation to determine your best defense in combating your Winter Park domestic violence injunction hearing, 407 599-1234.